Fortnite is an online video game developed by Epic Games and released in 2017. It is available in three distinct game mode versions that otherwise share the same general gameplay and game engine: Fortnite: Save the World, a cooperative shooter-survival game for up to four players to fight off zombie-like creatures and defend objects with fortifications they can build, Fortnite Battle Royale, a free-to-play battle royale game where up to 100 players fight to be the last person standing, and Fortnite Creative, where players are given complete freedom to create worlds and battle arenas. The first two game modes were released in 2017 as early access titles and Creative was released on December 6, 2018. Save the World is available only for Windows, macOS, PlayStation 4, and Xbox One, while Battle Royale has been released for those platforms in addition for Nintendo Switch, iOS and Android devices. Not to be confused with fortnight. While the first two games have been successful for Epic Games, Fortnite Battle Royale became a resounding success, drawing in more than 125 million players in less than a year and earning hundreds of millions of dollars per month, and since has become a cultural phenomenon. Currently, Fortnite is distributed as three different game modes, using the same engine and has similar graphics, art assets, and game mechanics. Fortnite: Save the World is designed as player-versus-environment game, with four players cooperating towards a common objective on various missions. The game is set after a fluke storm appears across Earth, causing 98% of the population to disappear, and the survivors to be attacked by zombie-like "husks". The players take the role of commanders of home base shelters, collecting resources, saving survivors, and defending equipment that help to either collect data on the storm or to push back the storm. From missions, players are awarded a number of in-game items, which include hero characters, weapon and trap schematics, and survivors, all of which can be leveled up through gained experience to improve their attributes. Fortnite Battle Royale is a player-versus-player battle royale game for up to 100 players, allowing one to play alone, in a duo, or in a squad (usually consisting of three or four players). Weaponless players airdrop from a "Battle Bus" that crosses the game's map. When they land, they must scavenge for weapons, items, resources, and even vehicles while trying to stay alive and attack other players, eliminating them. Over the course of a round, the safe area of the map shrinks down in size due to an incoming storm; players outside that safe area take damage and can be eliminated if they fail to quickly evacuate. This forces remaining players into tighter spaces and encourages player encounters. The last player, duo, or squad remaining is the winner. Fortnite Creative is a sandbox game mode where players are given complete freedom to create anything they want on an island, such as battle arenas, race courses, platforming challenges and more. Epic Games reviews some of the most popular creations from Creative and rotate these into the Battle Royale map in an area called "The Block". In the first two modes, players can use a pickaxe to knock down existing structures on the map to collect basic resources that are wood, brick, and metal. Subsequently, in all modes, the player can use these materials to build fortifications with, such as walls, floors, and stairs. Such fortification pieces can be edited to add things like windows or doors. The materials used have different durability properties and can be updated to stronger variants using more materials of the same type. Within Save the World this enables players to create defensive fortifications around an objective or trap-filled tunnels to lure husks through. In Battle Royale, this provides the means to quickly traverse the map, protect oneself from enemy fire, or to delay an advancing foe. Players are encouraged to be very creative in designing their fortifications in Creative. All game modes are set to be free-to-play titles, though, as of 2019, Save the World is in early access and requires purchase to play. The first two games are monetized through the use of V-Bucks, in-game currency that can be purchased with real-world funds, but also earned through completing missions and other achievements in Save the World. V-Bucks in Save the World can be used to buy pinatas shaped like llamas to gain a random selection of items. In "Battle Royale", V-Bucks can be used to buy cosmetic items like character models or the like, or can also be used to purchase the game's Battle Pass, a tiered progression of customization rewards for gaining experience and completing certain objectives during the course of a "Battle Royale" season. Fortnite began from an internal game jam at Epic Games following the publishing of Gears of War 3 around 2011. Though it was not initially one of the developed titles during the jam, the concept of merging the construction game genre, representing games like Minecraft and Terraria, and shooter games arose, leading to the foundation of Fortnite. Development of Fortnite slowed due to several issues, including switching from the Unreal Engine 3 to Unreal Engine 4, a deeper role-playing game approach to extend the life of the game, and a switch of art style from a dark theme to a more cartoonish style. Further, Epic was looking to get into the games as a service model, and brought in Chinese publisher Tencent to help; Tencent took a large stake in Epic as part of this, leading to the departure of several executives, including Cliff Bleszinski, who had been a key part of Fortnite's development. Fortnite's approach was changed to be Epic's testbed for games as a service, and further slowed the development. Ultimately, Epic was able to prepare to release Fortnite as a paid early access title in July 2017, with plans to release it as free-to-play sometime in 2019 while gaining feedback from players to improve the game. With the release of Fortnite Battle Royale, the player-versus-environment mode was distinguished as "Save the World". Near the same time that Epic released Fortnite into early access, PlayerUnknown's Battlegrounds had become a worldwide phenomenon, having sold over 5 million copies three months from its March 2017 release, and drawing strong interest in the battle royale genre. Epic recognized that with the Fortnite base game, they could also do a battle royale mode, and rapidly developed their own version atop Fortnite in about two months. By September 2017, Epic was ready to release this as a second mode from "Save the World" in the paid-for earlier access, but then later decided to release it as a free game, Fortnite Battle Royale, supported with microtransactions. This version quickly gained players, with over 10 million players during its first two weeks of release, and leading Epic to create separate teams to continue the Fortnite Battle Royale development apart from the "Save the World" mode, outside of common engine elements and art assets. This allowed Fortnite Battle Royale to expand to other platforms otherwise not supported by the "Save the World" mode, including iOS and Android mobile devices and the Nintendo Switch. A creative mode launched on December 6, 2018, coincident with the start of Season 7 of Fortnite Battle Royale. Here, each player has access to a private, persistent island which they construct buildings and add and manipulate objects as desired. Players are able to invite friends to this island, and participate in unofficial games such as race tracks or jumping courses. Initially, only players who bought the Battle Pass could get their own private island, but players who didn't purchase it got access to this game mode for free on December 13. With all modes of Fortnite still considered to be early access, journalists have yet to provide comprehensive reviews of any mode. The Save the World mode achieved over one million players by August 2017, just prior to the release of Battle Royale. Fortnite Battle Royale, on the other hand, became a significant financial success for Epic Games, leading them to separate the teams between Save the World and Battle Royale to provide better support for both modes. Within two weeks of release, over 10 million players had played the mode, and by June 2018, just after the Nintendo Switch release, had reached 125 million players. Revenue from Fortnite Battle Royale during the first half of 2018 had been estimated in the hundreds of millions of dollars per month. with total 2018 revenue estimated at $2.4 billion by analysis firm SuperData Research. Fortnite Battle Royale has also become a cultural online phenomenon, with several celebrities reporting they play the game, and athletes using Fortnite emotes as victory celebrations. 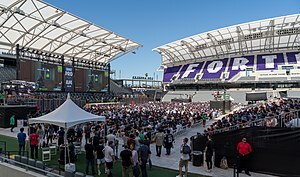 A notable streaming event in March 2018, with streamer Ninja playing Fortnite Battle Royale alongside Drake, Travis Scott, Kim DotCom, and Pittsburgh Steelers wide receiver JuJu Smith-Schuster, broke viewership records for Twitch to date, and led to Epic arranging a Fortnite Battle Royale pro–am with 50 pairs of streamers and professional players matched with celebrities at the Electronic Entertainment Expo 2018 in June 2018. Epic Games is working to develop organized eSports competitions around Fortnite Battle Royale, including a Fortnite World Cup tournament in 2019. There has also been growing concern over Fortnite Battle Royale's draw toward young children, emphasized with the release of the mobile client. Parents and teachers had expressed concern that students are being distracted and drawn away from school work due to playing Fortnite. Concerns have also been raised about the impact that playing a game involving repeated depictions of gun violence may have on young children. In 2017, the game was nominated for "Best Co-op Game" by PC Gamer, and for "Best Spectator Game" by IGN. In 2018, the game won the award for Best Ongoing Game by PC Gamer and IGN, the latter of which nominated it for "Best Nintendo Switch Game", "Best Mobile Game", and "Best Action Game". Ed Zobrist (March 22, 2018). Fortnite: An Unconventional Launch. Game Developers Conference. Retrieved July 24, 2018 – via YouTube. ↑ Goslin, Austen (December 6, 2018). "Epic Games announced The Block, a new Fortnite in-game community spotlight". Polygon. Retrieved December 6, 2018. ↑ Alwani, Rishi (5 Feb 2019). "Fortnite Save the World Is 50 Percent Off During Fortnite Lunar New Year Sale 2019". Gadgets360. ↑ Kim, Matt (March 1, 2018). "Fortnite's V-Bucks Currency is Another Battleground for a Community at Odds". USGamer. Archived from the original on March 23, 2018. Retrieved March 22, 2018. ↑ Frushtick, Russ (March 16, 2018). "Should you spend money on Fortnite?". Polygon. Archived from the original on March 20, 2018. Retrieved March 20, 2018. ↑ McWhertor, Michael (March 26, 2014). "What's the future of games at Epic Games?". Polygon. Archived from the original on June 27, 2017. Retrieved June 9, 2017. 1 2 Inside the Development History of Fortnite. Game Informer. YouTube. April 25, 2014. Retrieved June 29, 2018. ↑ Peel, Jeremy (June 8, 2017). "Why has Fortnite taken so long?". PCGamesN. Archived from the original on December 1, 2017. Retrieved November 29, 2017. ↑ Robinson, Martin (August 11, 2017). "The big Cliff Bleszinski interview". Eurogamer. Archived from the original on December 1, 2017. Retrieved November 29, 2017. ↑ Valdes, Giancarlo (March 22, 2018). "The Story Behind 'Fortnite's' Less Popular Mode". Glixel. Archived from the original on March 22, 2018. Retrieved March 22, 2018. ↑ Hall, Charlie (June 8, 2017). "Fortnite announces early access release, hands-on the unfinished game". Polygon. Archived from the original on November 23, 2017. Retrieved June 8, 2017. ↑ Nunneley, Stephany (July 21, 2017). "Fortnite Early Access has started for those who pre-ordered Founder's Packs". VG247. Archived from the original on August 2, 2017. Retrieved July 29, 2017. ↑ Arif, Shabana (October 22, 2018). "Fortnite's Save the World free-to-play launch pushed back to next year at the earliest". VG247. Retrieved October 22, 2018. ↑ Crecente, Brian (January 15, 2018). "'Fortnite: Battle Royale': The Evolution of World's Largest Battle Royale Game". Glixel. Archived from the original on January 27, 2018. Retrieved January 26, 2018. ↑ Duggan, James (April 17, 2018). "How Fortnite Became The Biggest Game In The World". IGN (video). Archived from the original on April 18, 2018. Retrieved April 17, 2018. ↑ Davenport, James (March 22, 2018). "Fortnite Battle Royale was developed in just two months, wasn't originally free-to-play". PC Gamer. Archived from the original on March 22, 2018. Retrieved March 22, 2018. ↑ Hall, Charlie (April 2, 2018). "Fortnite now available for everyone on iOS". Polygon. Archived from the original on April 2, 2018. Retrieved April 2, 2018. ↑ Kuchera, Ben (June 12, 2018). "Fortnite for Nintendo Switch is out today". Polygon. Archived from the original on June 14, 2018. Retrieved June 12, 2018. ↑ Webster, Andrew (December 5, 2018). "Fortnite's Minecraft-like creative mode launches tomorrow". The Verge. Retrieved December 5, 2018. ↑ Boyd, Jordan (August 19, 2017). "Fortnite Celebrates One Million Players; New Survival Mode Announced". Dualshockers. Archived from the original on August 19, 2017. Retrieved August 19, 2017. ↑ Makuch, Eddie (October 12, 2017). "Fortnite: Battle Royale Has Hit 10 Million Players In Two Weeks". GameSpot. Archived from the original on February 6, 2018. Retrieved October 16, 2017. ↑ Statt, Nick (June 12, 2018). "Fortnite now has 125 million players just one year after launch". The Verge. Archived from the original on June 13, 2018. Retrieved June 12, 2018. ↑ Thier, Dave (May 24, 2018). "Report: 'Fortnite: Battle Royale' Made Nearly $300 Million Last Month". Forbes. Archived from the original on May 28, 2018. Retrieved June 4, 2018. ↑ Molla, Rani (June 26, 2018). "Fortnite is generating more revenue than any other free game ever". Recode. Archived from the original on July 6, 2018. Retrieved July 5, 2018. ↑ Handrahan, Matthew (January 16, 2019). "Fortnite tops SuperData's 2018 chart with $2.4 billion digital revenue". GamesIndustry.biz. Retrieved January 16, 2019. ↑ "Celebrities Who Play Fortnite - Drake, Chance the Rapper and More!". Twin Galaxies. Archived from the original on March 18, 2018. Retrieved April 25, 2018. ↑ "'Fortnite' streamer breaks Twitch records with help from Drake". Engadget. Archived from the original on March 15, 2018. Retrieved March 16, 2018. ↑ Davenport, James (June 13, 2018). "Fortnite Celebrity Pro-Am Twitch channel breaks 700,000 concurrent viewers". PC Gamer. Archived from the original on June 14, 2018. Retrieved June 13, 2018. ↑ Goslin, Austen (June 12, 2018). "Epic announces the 2019 Fortnite World Cup event". Polygon. Archived from the original on June 13, 2018. Retrieved June 12, 2018. ↑ Stewart, Keith (March 7, 2018). "Fortnite: a parents' guide to the most popular video game in schools". The Guardian. Retrieved July 6, 2018. ↑ "What should I know about Fortnite – is it ok for kids to play?]". Center on Media and Child Health. May 22, 2018. Retrieved September 2, 2018. ↑ Griffin, Andrew (May 3, 2018). "Fortnite Could Endanger Children And Expose Them To Violence, NSPCC Claims". The Independent. Retrieved September 2, 2018. ↑ PC Gamer staff (December 8, 2017). "Games of the Year 2017: The nominees". PC Gamer. Archived from the original on January 6, 2018. Retrieved January 22, 2018. ↑ "Best of 2017 Awards: Best Spectator Game". IGN. December 20, 2017. Archived from the original on December 26, 2017. Retrieved January 22, 2018. ↑ PC Gamer staff (December 28, 2018). "Game of the Year Awards 2018". PC Gamer. ↑ IGN staff (December 10, 2018). "Best Ongoing Game of 2018". IGN. Retrieved December 24, 2018. ↑ IGN staff (December 10, 2018). "Best Nintendo Switch Game of 2018". IGN. Retrieved December 24, 2018. ↑ IGN staff (December 10, 2018). "Best Mobile Game of 2018". IGN. Retrieved December 24, 2018. ↑ IGN staff (December 10, 2018). "Best Action Game (Including Shooter) of 2018". IGN. Retrieved December 24, 2018. ↑ Makuch, Eddie (December 8, 2017). "The Game Awards 2017 Winners Headlined By Zelda: Breath Of The Wild's Game Of The Year". GameSpot. Archived from the original on December 9, 2017. Retrieved January 22, 2018. ↑ Giardina, Carolyn (January 16, 2018). "Visual Effects Society Awards: 'Apes,' 'Blade Runner 2049' Lead Feature Nominees". The Hollywood Reporter. Archived from the original on January 16, 2018. Retrieved January 22, 2018. ↑ Giardina, Carolyn (February 13, 2018). "Visual Effects Society Awards: 'War for the Planet of the Apes' Wins Big". The Hollywood Reporter. Archived from the original on February 14, 2018. Retrieved February 13, 2018. ↑ Makuch, Eddie (January 14, 2018). "Game Of The Year Nominees Announced For DICE Awards". GameSpot. Archived from the original on January 17, 2018. Retrieved January 17, 2018. ↑ Makuch, Eddie (February 22, 2018). "Legend Of Zelda: Breath Of The Wild Wins Game Of The Year At DICE Awards". GameSpot. Archived from the original on February 23, 2018. Retrieved February 23, 2018. ↑ McNeill, Andrew (January 31, 2018). "Here Are Your 2018 SXSW Gaming Awards Finalists!". SXSW. Archived from the original on February 1, 2018. Retrieved February 1, 2018. ↑ "2018 SXSW Gaming Awards Winners Revealed". IGN. March 17, 2018. Archived from the original on March 18, 2018. Retrieved March 18, 2018. ↑ deAlessandri, Marie (March 15, 2018). "Hellblade: Senua's Sacrifice at forefront of BAFTA Games Awards nominations". Mcv. Archived from the original on March 16, 2018. Retrieved March 16, 2018. ↑ Makedonski, Brett (April 12, 2018). "BAFTA names What Remains of Edith Finch its best game of 2017". Destructoid. Archived from the original on April 25, 2018. Retrieved April 13, 2018. ↑ Kaufman, Gil (April 24, 2018). "JAY-Z, RuPaul, Lady Gaga, Katy Perry & Kourtney Kardashian Among 2018 Webby Award Winners: See the Full List". Billboard. Archived from the original on April 25, 2018. Retrieved April 24, 2018. ↑ Faller, Patrick (June 28, 2018). "E3 2018: Game Critics Awards Nominations Revealed: Anthem, Super Smash Bros. Ultimate Top The List". GameSpot. Retrieved June 29, 2018. ↑ Shanley, Patrick (July 2, 2018). "Game Critics Awards: Best of E3 2018 Winners Revealed". The Hollywood Reporter. Retrieved July 2, 2018. ↑ MCV staff (May 21, 2018). "Announcing the Develop Awards 2018 nominations shortlist". Mcv. Retrieved September 4, 2018. ↑ Barton, Seth (July 12, 2018). "The Develop Awards 2018: All the winners!". Mcv. Retrieved September 5, 2018. ↑ Cohen, Jess (June 22, 2018). "Teen Choice Awards 2018: Avengers: Infinity War, Black Panther and Riverdale Among Top Nominees". E!. Retrieved June 25, 2018. ↑ Ramos, Dino-Ray (August 12, 2018). "Teen Choice Awards: 'Riverdale', 'Infinity War', 'Black Panther' Among Top Honorees – Full Winners List". Deadline Hollywood. Retrieved August 13, 2018. ↑ Hoggins, Tom (September 24, 2018). "Golden Joysticks 2018 nominees announced, voting open now". The Daily Telegraph. Retrieved October 7, 2018. ↑ Andronico, Michael (October 26, 2018). "Golden Joystick Awards: Vote for Ultimate Game of the Year". Tom's Guide. Retrieved November 14, 2018. ↑ Sheridan, Connor (November 16, 2018). "Golden Joystick Awards 2018 winners: God of War wins big but Fortnite gets Victory Royale". GamesRadar+. Retrieved November 16, 2018. ↑ Crecente, Brian (November 13, 2018). "'God of War,' 'Red Dead Redemption II' Tie For Most Game Awards Noms". Variety. Retrieved November 13, 2018. ↑ Crowd, Dan (December 6, 2018). "The Game Awards 2018: All The Winners". IGN. Retrieved December 6, 2018. ↑ "2018 Gamers' Choice Awards". Gamers' Choice Awards. December 9, 2018. Retrieved January 3, 2018. ↑ "Your 2018 Winners". Australian Games Awards. December 19, 2018. Retrieved January 3, 2018. ↑ Makuch, Eddie (January 10, 2019). "God Of War, Spider-Man Lead DICE Awards; Here's All The Nominees". GameSpot. Retrieved January 14, 2019. ↑ Nunneley, Stephany (February 14, 2019). "God of War takes home Game of the Year, eight other awards at 2019 D.I.C.E. Awards". VG247. Retrieved February 14, 2019. ↑ "Nominee List for 2018". National Academy of Video Game Trade Reviewers. February 11, 2019. Retrieved February 14, 2019. ↑ Trent, Logan (February 11, 2019). "Here Are Your 2019 SXSW Gaming Awards Finalists!". South by Southwest. Retrieved February 15, 2019.